Elite Force has deployed personnel in all over the country. 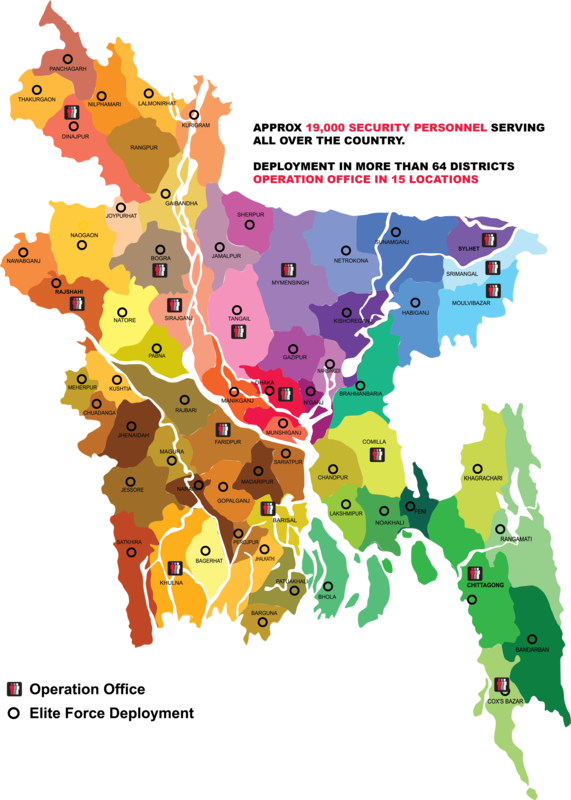 Our capability to mobilize personnel to any remote part of Bangladesh surpasses all others. We are everywhere. As of today Elite Force has over 16000 guards, which is one of the highest numbers of employees in a security company in Bangladesh. Our ever-increasing force is constantly vigilant all over the country and is equipped to coordinate, respond and handle any hazard, anytime, anywhere. We have set up 8 regional offices and 5 regional sub-offices to reach clients spread out all over the country. Elite Force has a state of the art training center in Dhaka, 2KM away from Baridhara. We are the only security company in the country to provide service even in the remotest possible areas of Bangladesh.